Roads in 4 (four) East Java Regencies, namely Gresik, Lamongan, Tuban and Bojonegoro are increasingly brighter after the presence of 1,200 Public Street Lighting- Solar Light (PJU-TS) built by the Ministry of Energy and Mineral Resources through the Directorate General of New Renewable Energy and Energy Conservation (EBTKE ) The handover of the unit was carried out by the Head of the Special Oil and Gas Work Unit (SKK Migas) Dwi Sudjipto on Saturday (9/10). "The problem of infrastructure needed by the community is a major concern for the Government. 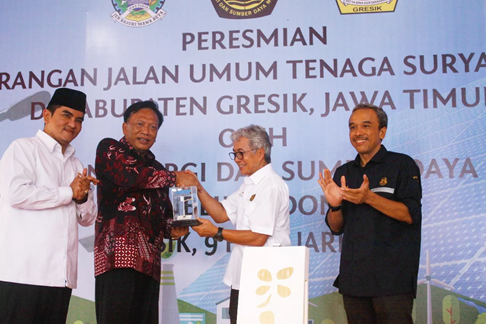 For this reason, we built Public Street Lighting- Solar Light (PJU-TS) to improve the welfare of the community," Dwi said when 150 Public Street Lighting (PJU) were handed over to the people of Kebomas, Gresik. While Lamongan Regency gets 450 units and Tuban Regency and Bojonegoro Regency which has received development assistance from the Government of 300 units each. Public Street Lighting- Solar Light (PJU-TS) is a street lighting lamp that uses sunlight as a source of electrical energy. "This could be a solution to be used on roads in areas that have not been reached by PLN electricity or in areas that have been electrified by the National Electric Company but want to reduce the electricity consumption of the region," Dwi added. Dwi disclosed the presence of Public Street Lighting- Solar Light (PJU-TS) is part of the implementation of energy policy transformation from conventional energy use to new renewable energy. The government advised the Regional Government to maintain the Public Street Lighting- Solar Light (PJU-TS) facilities that had been provided. "It will be managed and maintained by the local government, I hope to keep it as good as possible," he ordered. 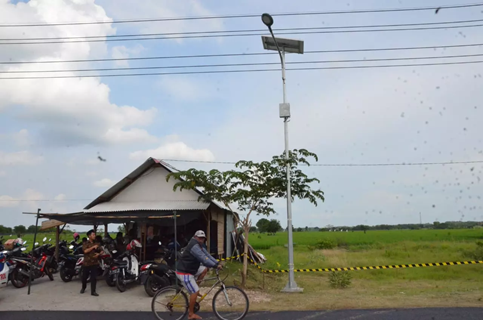 Particularly for East Java province, the region received 3,288 points of Public Street Lighting (PJU) installation in 2018 by the Ministry of Energy and Mineral Resources. In general, in 2018 the program is targeted to be able to illuminate roads in 26 provinces. "We have raised funds of around Rp.416 billion with 21,864 Public Street Lighting- Solar Light (PJU-TS) points," Dwi concluded, completing his remarks. Responding to this, Gresik Regent Sambari Halim Radianto welcomed the assistance because it would improve the people's economy. "If the road is already full of light , the economy of the community is also getting stronger," Sambari said. As is known, from 2015 to 2018, the Ministry of Energy and Mineral Resources has built around 33 thousand lamps of Public Street Lighting- Solar Light (PJU-TS) starting from the provincial to district levels. By utilizing the potential of solar energy which is converted into electrical energy, it certainly does not produce pollution. Public Street Lighting- Solar Light (PJU-TS) is a solution for roads in areas that have not been reached by PLN electricity or areas that have been electrified by the National Electric Company, but want to reduce the electricity consumption of their regions, which are mostly supplied by fossil energy sources.